Bake this decadent ooey-gooey s’more brownies recipe in the oven or on the grill. A fun and delicious camping-inspired dessert for kids of all ages! It’s almost summer and that means camping season! Growing up, we spent a lot of time camping with family and friends. I always looked forward to being on the boat and, of course, evenings around the campfire. We do less camping than we used to, but having evening fires, whether it’s in our own backyard or at the lake, is a summer highlight. Good company, along with a cocktail (or two) and s’mores, are quintessential memory makers! To celebrate the onset of camping or “glamping” season, I thought I’d share an easy skillet dessert you can make on the grill or in your oven. Ooey-gooey chocolate, marshmallows and graham wafers in spoonable form. 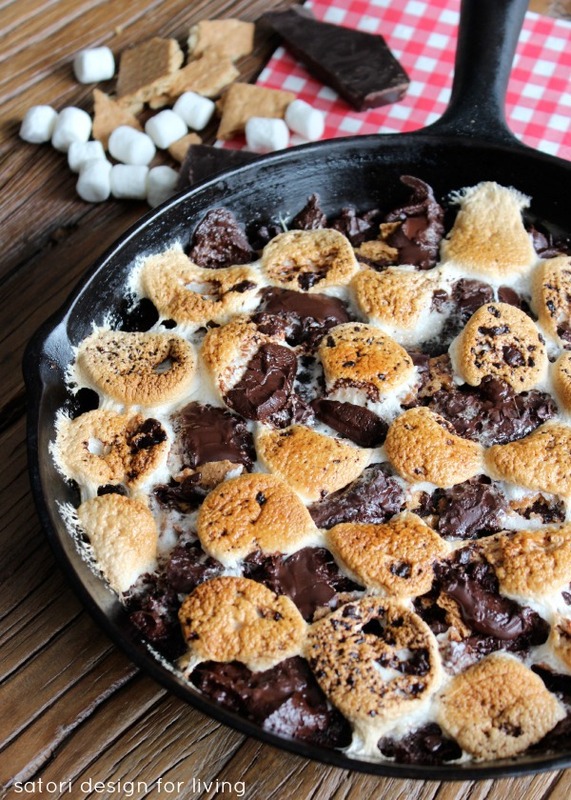 When it comes to camping desserts, what could be better than s’more brownies? Tip: To make things easier, combine dry ingredients and place in a jar or container to take with you camping. Preheat oven or grill to 350 degrees F. Grease 10″ cast iron skillet with coconut oil or butter. Place dry ingredients in a medium sized bowl and mix in eggs and vanilla. Gradually add melted butter, stirring until well combined. Pour batter into skillet and top with graham wafer pieces. Tip: If cooking on the grill, watch your temperature gage to make sure it doesn’t get too high. Avoid peeking or the heat will escape. I find it works best to have only the front and back heat sources on while baking on the grill. Remove brownies from the oven or grill. 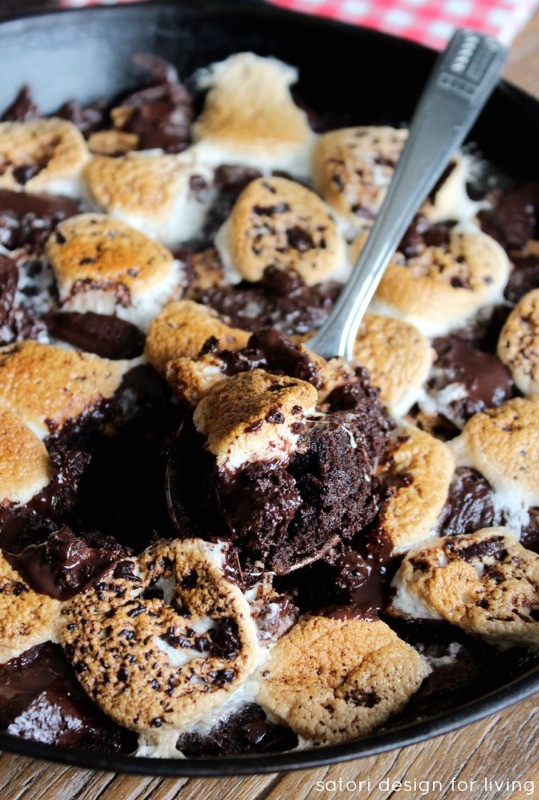 Turn heat up to 400 degrees F.
Top brownie with marshmallows cut side down. Sprinkle chocolate chunks on top. Place back in oven or grill for 5-7 minutes until marshmallows turn golden brown and the chocolate is soft. Tip: Use broiler or torch if you prefer your marshmallows to be darker. Watch closely! I should warn you, this s’more brownies version is just as messy and indulgent as campfire s’mores. So worth it in my opinion! Think of it as a s’more brownies pie you can dig into with a spoon. Such a yummy camping dessert recipe! A decadent camping-inspired dessert that will please kids of all ages! To make things easier, combine dry ingredients and place in a jar or container to take with you camping. Preheat oven or grill to 350 degrees F. Grease 10" cast iron skillet with coconut oil or butter. Tip: If cooking on the grill, watch your temperature gage to make sure it doesn't get too high. Avoid peeking or the heat will escape. I find it works best to have only the front and back heat sources on while baking on the grill. 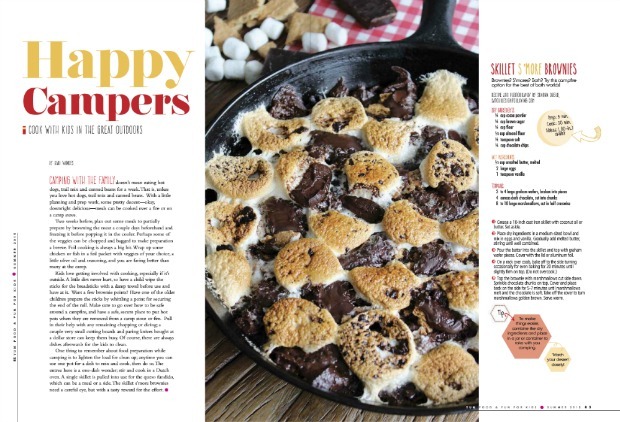 See the recipe for this Skillet S’more Brownies camping dessert recipe featured in Yum Food and Fun Magazine! 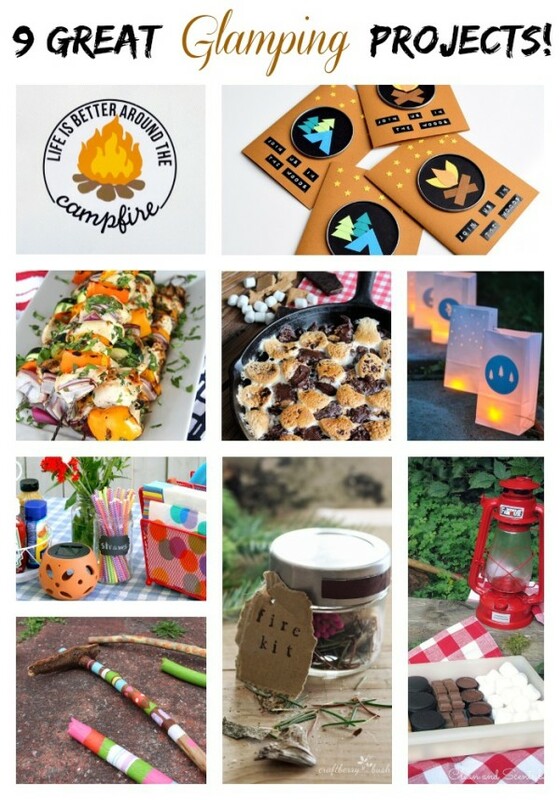 Looking for more summer camping ideas? Ooooh this looks like summer in a dish…I could inhale the whole thing by myself! YUM! This is the kind of dish that you put in the middle of the table and everyone grabs a spoon… This looks AMAZING, Shauna! I love it! I want some… and right now!!! YUM!!!! Oh my word this look SOOOOO yummy. I think this will have to be added to our camping to-do (rather to-eat) list! These look SO unbelievably amazing!! Can’t wait to try! This looks so gooey and perfect!